Simmons was a demon minion loyal to Lucifer. As Lucifer is holding a half-hearted court with demons, Simmons steps forward, asking Lucifer for some direction. She claims they could deploy a force to find Amara, but they have a had a fool and coward running Hell for too long. Appearing to show pity for Crowley, Simmons breaks him out of his cage. As they are leaving, they are confronted by two demons. 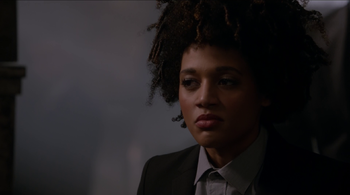 Crowley throws Simmons at them as a distraction, allowing him to kill the demons with an angel blade. Now free and with a new pair of clothes, Crowley and Simmons head to his secret lock-up. While there, Crowley reveals to Simmons he is in possession of a "Hand of God" -- the Rod of Aaron. Just as he is about to open the box containing it, Lucifer arrives and reveals his escape and Simmons' involvement had all been a ruse so he can get his hands on the Rod of Aaron. When Crowley gains possession of the rod, he attempts to use its power to kill Lucifer. However, Simmons throws herself in front of the blast, obliterating her and sending Lucifer flying into the wall. This page was last edited on 1 July 2018, at 00:59.